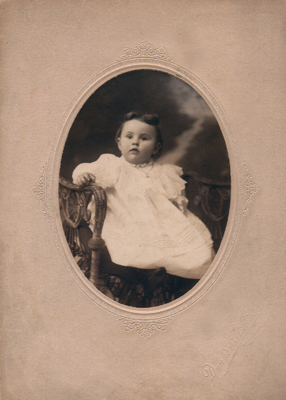 Vincent was born on 6 December 1878 in Highland, Missouri, to Mary Rosella Guyot who had immigrated from France to the United States. Vincent's father was Henry Dunker Jr. who had been born in Germany. 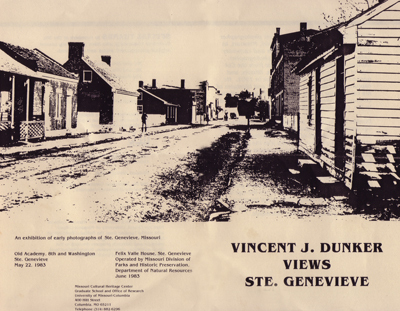 Vincent was baptized on 13 January 1879 at the St. Boniface Church in Perryville, Missouri. The population of Highland was 16,000 in the year 2000, but too small to show in the 1890 census. Nearby Perryville where Vincent's parents lived had less than 900 residents at that time. 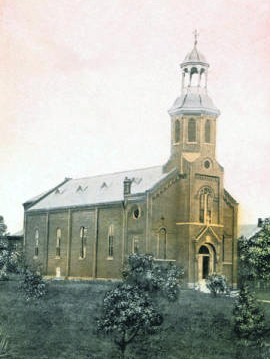 St. Boniface Church on Fellz Street in Perryville, Missouri, where Vincent was baptized in 1879. The church no longer exists. After finishing high school, Vincent worked as a blacksmith and carpenter. He then studied photography obtaining a master's degree from the Illinois (Effingham) College of Photography in Effingham, Illinois (Missouri Cultural Heritage Center, University of Missouri-Columbia). 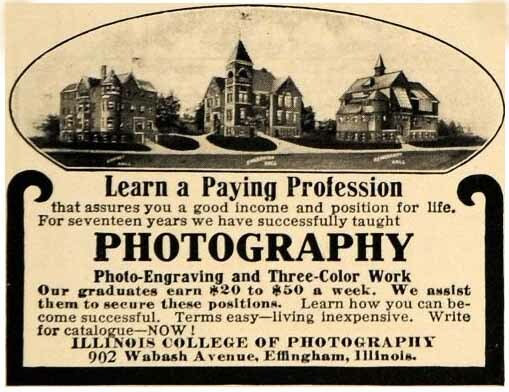 Early ad for the Illinois College of Photography at Effingham, Illinois. In 1898 Vincent moved to Ste. Genevieve, Missouri, and opened a photography studio. He soon became well known as an outstanding portrait photographer. On 28 Oct 1902, Vincent married Ottie May Boyer, also of Ste. Genevieve. In addition to operating a portrait studio, Vincent also took many photos of the city of Ste. Genevieve and in 1900 he published a small booklet of photos titled Souvenir Letter, Ste. Genevieve, Mo. 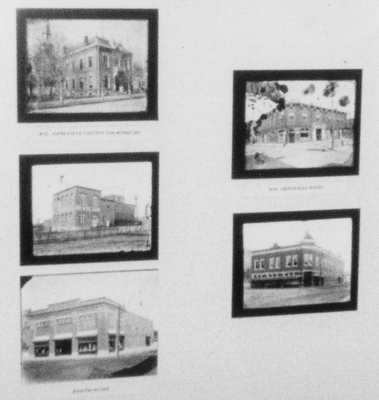 A copy of the booklet is on file with the Missouri History Museum, call number: MO 9.10 Sa2g. "Vincent Dunker, for 10 years an artist photographer at Ste. 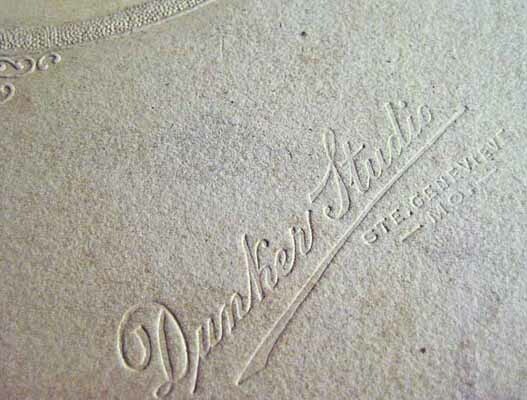 Genevieve, Mo., has opened a studio at 203 Broadway, in the Grissom building." The Southeast Missorian, April 8, 1911. 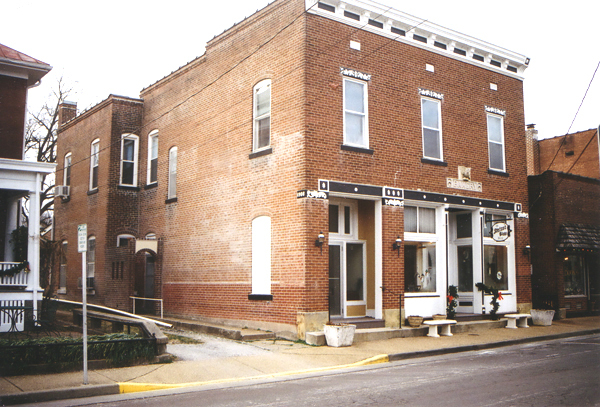 Grissom / Calhoon Building in Cape Girardeau. Built in 1910, razed in the late 1980s.
" Mrs. Vincent Dunker, with daughter Majella, of Ste. Genevieve, Mo., arrived yesterday to join her husband, who has opened a new photography studio in the Grissom building on Broadway; they will make their home on North Fountain Street." The Southeast Missourian, April 19, 1911. In 1924, Vincent built his first 35 mm long-roll camera which he intended to use for taking school pictures, but another photographer bought the camera from him for $100 (about $1,300 in 2011 dollars). He made a second camera, but quickly sold it also. As a result, he dropped the idea of becoming a school photographer and instead began building cameras for sale under the name VE-JA-DE Products, from his initials, V.J.D., while also operating a photography studio (Ste. Genevieve - A Leisurly Stroll Through History, page 33) . Vincent handbuilt all his cameras from walnut that he selected himself. Many of the parts such as the rollers and various aluminum pieces were also handmade. One of those cameras is now in the George Eastman House (Kodak) Museum in Rochester, New York. Another camera is in the Vaughn-Applegate Collection of the Shiloh Museum of Ozark History in Springfield, Arkansas. Two others are in the DigiCamHistory.Com collection. Many of Vincent's cameras were 35 mm, but he also made at least three different models of 70 mm long roll film cameras. One used an external apparatus for focusing and another use an internal system. (DigiCamHistory.Com,1950's page). According to Vincent's grandson, Leo Pruneau, production was fairly evenly divided between 35 mm and 75 mm cameras. Annual production in 1948 when Leo began working with his grandfather was about 300 units, but had declined to about 150 units annually when Leo left for college in 1958. During World War II Vincent sold many hundreds, possibly thousands of his cameras to the U.S. Army for use in making IDs, photos of recruits, war prisoners, etc. (Missouri Cultural Heritage Center, University of Missouri-Columbia). He also designed and sold a photo booth of the type whereby direct prints could be made for customers in a few minutes (Popular Mechanics, Advertising Section page 43A, March 1936). In 1925 Vincent's daughter Majella graduated from Ste. Genevieve High School. She later married Leo Pruneau Sr. of Ste. Genevieve. Leo and Majella provided the happy grandfather with four grandsons and a grandaughter (Leo Jr., Velda, Bill, and the twins, Lewis and Clark). In 1926, Vincent filed for a patent for a contact printer that is somewhat similar in design to the many contact printers sold by Kodak in the 30s and 40s, but rather than making one contact print at a time, the Dunker printer was designed to use a long roll of contact paper inside along with strips of negatives on top of the printer to produce contact prints in a much more rapid manner than other contact printers of the time (patent No. 1,693,891). His contact printer was sold throughout the United States as well as overseas (Ste. 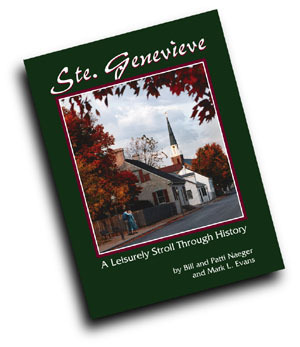 Genevieve - A Leisurly Stroll Through History, page 33). "Paul Leuders, son of Mr. And Mrs. H.L. Lueders, 361 north park Avenue, Sunday went to Ste. Genevieve to take over the Vincent Dunker art studio, under a lease. 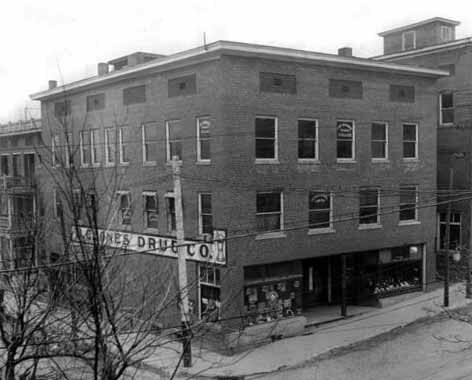 Mr. Dunker, who formerly had a photographers shop in the Cahoon Building here, is to devote his time to manufacturer of cameras in Ste. Genevieve." City Briefs, The Southeast Missourian, April 12, 1937. Building at 252 Merchant Street in Ste. Genevieve previously owned by Vincent Dunker. the building was constructed in 1908. The front portion and upper story were rented out to others. 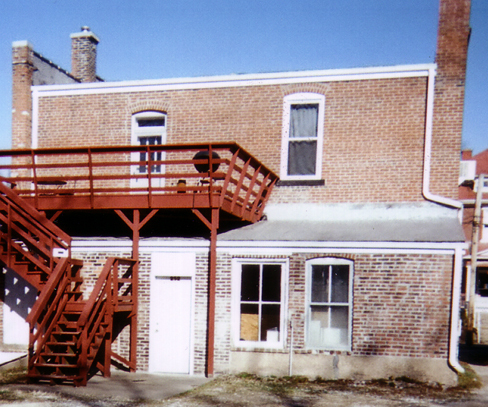 The entrance to his photo studio can be seen toward the rear of the building (photo on the left). His camera manufacturing workshop was located behind the building on the first floor (photo on the right). Photos courtesty of Vincent Dunker's grandson, William Pruneau Jr. In August of 1945, Vincent's wife Ottie died of complications resulting from cancer. In 1955, Vincent sold his studio portrait business to Betty Schwent Donze who at this time (2012) is still living in Ste. Genevieve, Missouri. 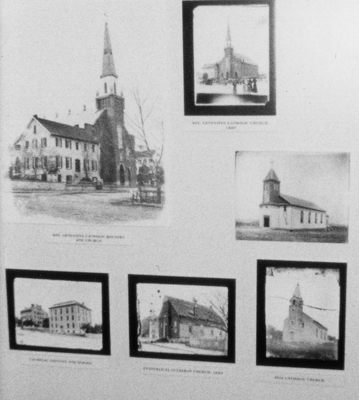 Many of the photographs used in Bill Naeger's Ste. Genevieve historical book and at a Missouri Historical Center exhibition honoring Vincent Dunker were provided by Betty Donze. "Betty Donze had apprenticed under Ste. Genevieve photographer Vincent Dunker and then bought his business in the mid '50s, acquiring many of Dunker's negatives in the deal." 573 Magazine, Negative Attitude, April 6, 2011. In the late 1950s Vincent sold a number of his cameras to Bremson Photo Industries of Kansas City. Bremson re-labeled them as Bremson Lustre-paks. Both Dunker and Bremson labeled cameras appear on eBay from time to time. In 1961 Vincent built his very last camera, a 70 mm model made for his friend Clem Donze of Ste. Genevieve. Clem still has that camera and is very proud of it. Vincent was 82 when he retired from the camera manufacturing business. Vincent died in 1974 at the age of 96. He is buried with his wife Ottie in the Valle Spring Cemetery, Ste. Genevieve. 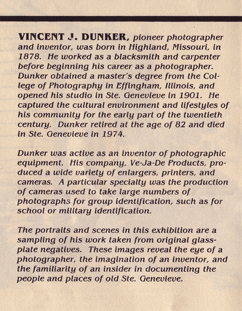 On the 22 nd of May 1983, the Missouri Cultural Heritage Center presented a Vincent J. Dunker exhibition in Ste. Genevieve, Vincent J. Dunker Views Ste. Genevieve. The exhibition included several Dunker cameras and numerous early photographs of Ste. Genevieve taken by Vincent. Flyer advertising the 1983 Dunker exhibition. A few of Vincent's photos shown at the 1983 exhibition. Cultural Heritage Center; Administrative Records, Dates: 1979-1993. Dunker photo of old Ste. 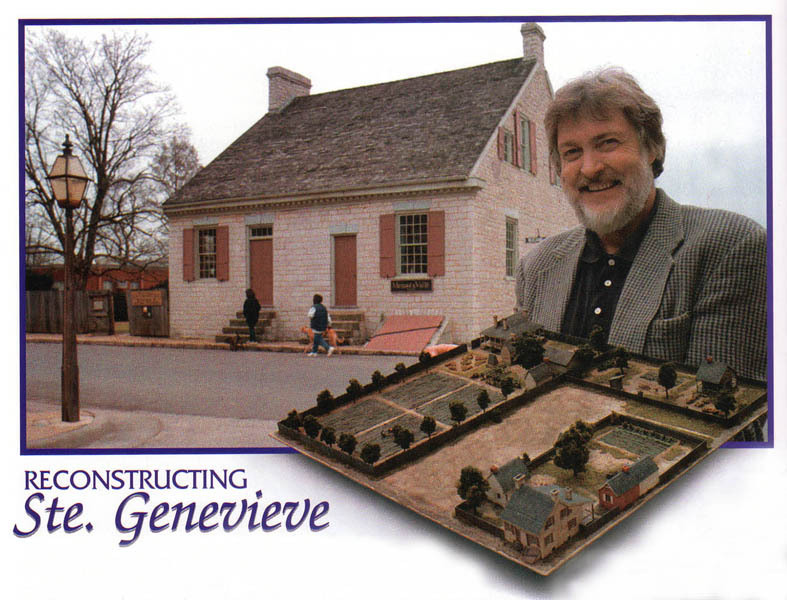 Genevieve as shown in Bill Naeger's book. 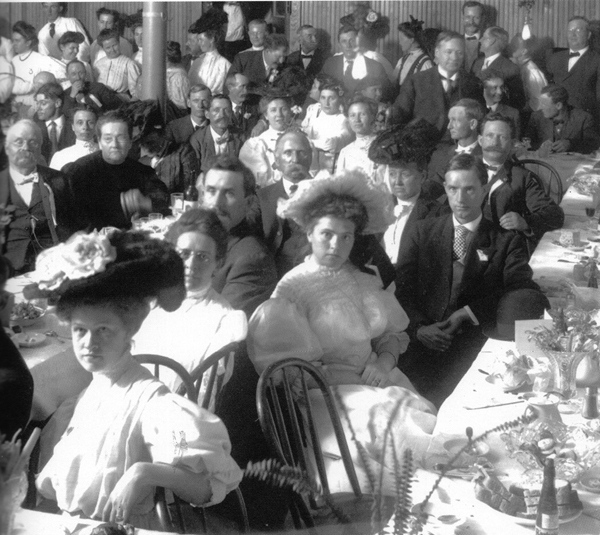 Dunker photo of a 1900 gala as shown in Bill Naeger's book. 1898 Photo by Dunker recently purchased on eBay. Vincent's grandson Lewis Prunea and a partial diorama of Ste. Genevieve. 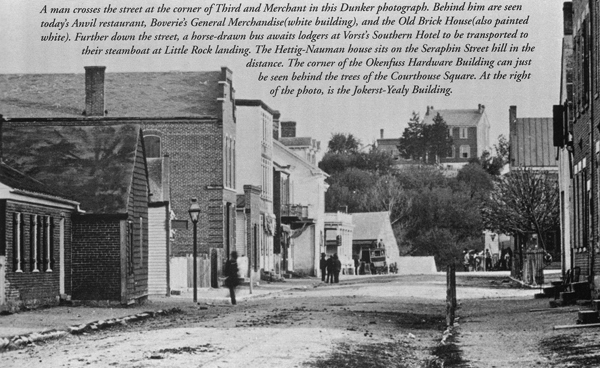 Merchant Street, Ste. Genevieve c1832. Leo Pruneau Jr. - Vincent Dunker was my grandfather, and mentor. We worked closely together through the majority of my formative years - late teens to late twenties - developing and producing his Ve-Ja-De line of school cameras, photographic printers and enlargers. Over time, Vincent taught me to manufacture all of the components as well as the final assembly of the products. He instructed me how to use the many tools involved, and how to safely operate the large power machines associated with wood and metal working. These were most valuable experiences, and the skills have stayed with me throughout my life. From my earliest days with him, he insisted that my craftsmanship be absolutely the best I could do. He would never accept any job that did not come up to his standards. If it didn't, it would have to be done over again. It was the detail that mattered. Vincent Dunker was an industrious, skilled and intelligent gentleman. Above all, he was a pioneer and inventor. He was also very human, with good and bad traits. He was quite generous, but nevertheless did not squander his assets. I am especially grateful that he taught me the value of money, how to use it and how to respect it. By small town standards, he became a relatively wealthy man through his successful camera and photographic business, but never once did he put on any pretentious airs or graces. He kept his common manner. Of typical photographer stature, he was tall and thin. He always wore a two piece suit, white shirt and tie (only removing the tie when working on a machine in which it could get caught). Even when working in the shop - on the bench - he was always 'properly' dressed. His car was a black Packard coupe, which he purchased new in 1937. Packards were well-built cars of that era, and his never let him down. He drove it daily, for over 20 years, to and from work, summer and winter. 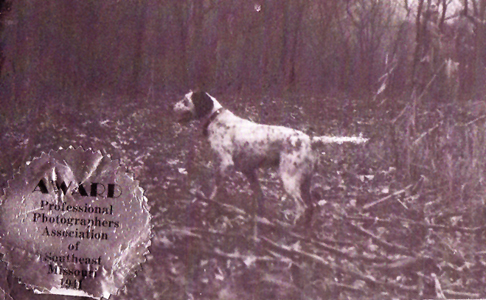 Vincent's constant companion in the Packard was one of several bird-dogs (pointers) he had through the years. With the dogs always riding in the front passenger seat, the wear and tear on the upholstery was devastating. In the end, only the bare springs remained! Grandfather loved quail shooting, which he did frequently during the season. He was a very good shot, more often than not bagging the limit. He was also a fine fly fisherman. Vincent had musical talent as well. The slide trombone was his instrument, and he played for years with his mates in the Ste. Genevieve Municipal Band. I never knew grandfather to drink spirits, and he wasn't keen on wine either, but he did like a beer with friends at the local tavern. Grandfather usually attended the annual photographers' convention in St. Louis. He always had a booth in which he displayed a selection of his Ve-Ja-De products. I remember that he always bought a new suit for the occasion, and looked very smart indeed. Vincent had a liking for American history, particularly the Civil War. I recall he had a copy of Matthew Brady's historical photographic record of the war, which he cherished. It was a huge book and we kids were never allowed to touch it. And on kids, Mother's last birth was twins: two boys. In some circumstances, the naming of twins can be agonizing. However, in this case, Vincent made the choice without hesitation - " Lewis and Clark ", and that was it. No discussion needed. In rare instances, grandfather could be a bit cantankerous. Towards the end of his driving career, the city council determined that an electric traffic light was necessary at a certain intersection in the middle of town. It would be the first in Ste. Genevieve, and was a most contentious issue with the citizens and the motoring public. Grandfather was against it. Thought it to be a damned nuisance! However, eventually the light was installed. To express his dissatisfaction, never once did the Packard, grandfather or the dog ever stop on a red light at that intersection. Fortunately, just about everyone in town knew the car and its driver, so they gave him the right of way. There never was an incident. The last camera project we worked on together was the development of the "Dunker 70mm Electronic". Basically, it was a major modification to the standard 70mm model, but was made fully automatic by the use of electronics. The shutter trip was converted from mechanical to electrical, and the film advance to the next frame was by electric motor drive. The system was fully automatic with the press of a button by the operator. Several prototypes were constructed before the final design was achieved. Vincent was very enthusiastic about the project. Although we got the camera operation functioning to all expectations, in the finish the mechanism became overly complicated. It would have been difficult to manufacture, and perhaps difficult to maintain. Accordingly, grandfather reluctantly abandoned it. Pity, it was years ahead of anything else in its field at the time (only one pre-production model was made). To conclude, my leaving grandfather was a great disappointment for him. I was the oldest son of his only child and daughter, and his heart was set on me succeeding him in the camera business. But it was not to be - My passion was a different career. Having let him down once, I was determined to succeed in my new endeavour so as to not let him down a second time. And I didn't...After leaving Ste. Genevieve to pursue my formal college education, some three years later my sister Velda and grandfather flew to California to attend my graduating ceremony. Vincent was there to witness my graduation and see me receive my degree with honours. He didn't say much but I can clearly remember the look about him: he was pleased - and proud. Everything had turned out fine. Leo Pruneau, Australia, December, 2011. 1937 Packard coupe of the type that Vincent Dunker drove for twenty years. Now that's getting your money's worth! Grandson - William Pruneau Jr. - I didn't get to spend much time with my grandpa, but he was there for me anytime. My grandpa and dad loved to bird hunt. Grandpa was a dear hunter also. Grandpa and dad would let me tag along on hunting trips sometimes. I loved him and miss him a lot. 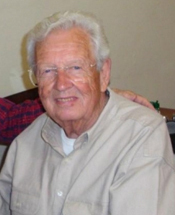 William Pruneau Jr., Ste. Genevieve, Missouri, February, 2012. Vincent Dunker possessed an unusual amount of artistic talent, imagination, engineering ability and good business sense. As can be seen below, these traits were passed down to his grandchildren. Grandson - Leo Pruneu Jr. - Leo received a Bachelor of Arts degree with honors in Transportation Design from the Art Center College of Design, Los Angeles, California, and began his career as an automotive design specialist at General Motors in February of 1961. One of his early projects while in Detriot was assisting Ron Hill in the styling of his masterpiece, the 1965 Chevrolet Corvair. Later, Leo was assigned to GM's British subsidiary, Vauxhall Motors. In 1975 Leo was promoted to director of design for GM's Australiain subsidiary, General Motors-Holden's Ltd, the pride of Australia. As design director, Leo was responsible for many of the beautifuly styled Holden automobiles which are now admired by automobile enthusiasts around the world. When doing a Google search for the name Leo Pruneau you will find many hundreds of citations, often referring to him as "Leo Pruneu, GM design guru," "Renowned Holden chief of design," or "the legendary American designer, Leo Pruneau." 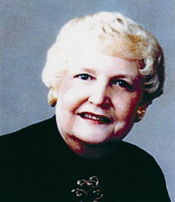 Grandaughter - Velda M. Pruneau Arnold - If Leo is the automovite guru, Velda is the real estate guru. She has a very successful real estate company in California specializing in multi-million dollar construction and estaes. Grandson - Lewis Pruneau - Lewis is shown above with his "Hindenburg Disaster" shadow box entry at the 2010 Chicago International Miniature Model Show. This was the first time Lewis had entered the competition since 1990 where he had won the gold medal twelve times previously. Lewis didn't dissapoint his many fans back in Ste. Genevieve, racking up gold medal number thirteen. Lewis has constructed many military dioramas that are so detailed and authentic that it is impossible tell the difference in a photograph between his dioramas and the actual scene. He is also an expert in structural dioramas and has bult more than one hundred exact replicas of homes and other buidings that existed in early Ste. Genevive. 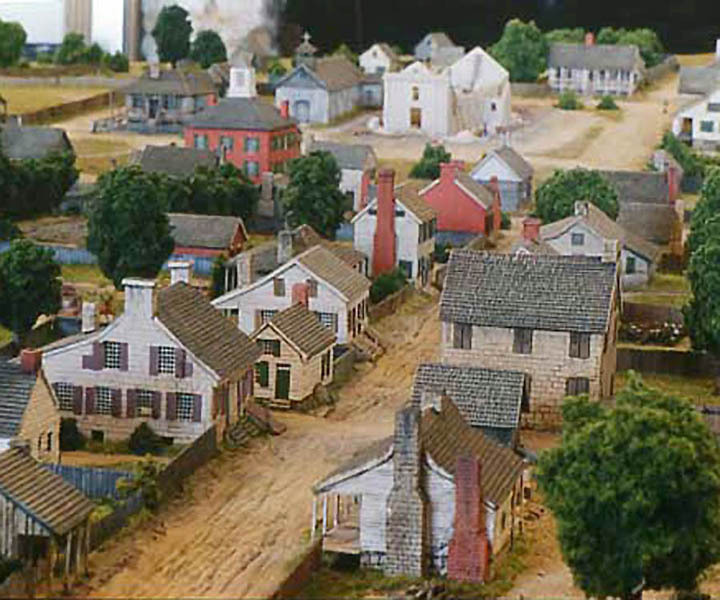 One professional diorama builder had this to say about Lewis, "If I had to pick only one, from a few I might add, then I'd have to say that the work of Lewis Pruneau has influenced and inspired me the most."